Starting our test of the 1.2V AA 3000 mAh VTEC Ultra Capacity 2 NiMH batteries as we normally do with a low constant current discharge rate of 0.2A and the result we got was just 2178 mAh as capacity. As we’ve already mentioned the VTEC brand by LRP/NOSRAM is supposed to be offering high quality products that do not come at a very affordable prices, so we repeated the test multiple times with different batteries, but the result was pretty much the same. And we are sure these are not some fake Chinese batteries branded as VTEC as we got them form an official distributor of NOSRAM. Getting less than 800 mAh capacity at lower discharge rate than the supposed capacity is a real disappointment, we really expected a much better result. Even if we take into account that the higher the capacity of NiMH batteries goes the faster they self-discharge in the first day after being fully charged, loosing so much in terms of capacity is just a few hours is way too much to be considered an option. And while the performance remains good when increasing the constant current discharge rate at up to 2.0A in our tests, these batteries clearly should’ve been labeled as 2200 mAh and not as 3000 mAh. 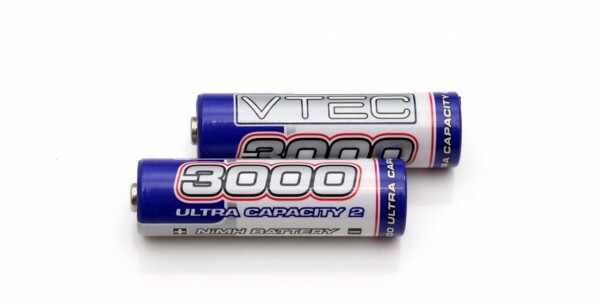 Again, these VTEC batteries have shown us really unsatisfactory performance and have disappointed us quite a lot, so there is no way we would recommend them as there are much better alternatives.